Logos Showcase for Visual Composer is the best well made and up to date AddOn built to display logos, clients and partners using V.C. Page Builder. Update: Fully Compatible with WordPress 4.3! Logos Showcase for Visual Composer is a premium WordPress plugin build to display and manage your logos and clients in many ways as a grid or as a slider. You have multiple special themes and effects that will help you to show your logos in so many different look. You can manage your logos by grouping into separate categories based on your demand. 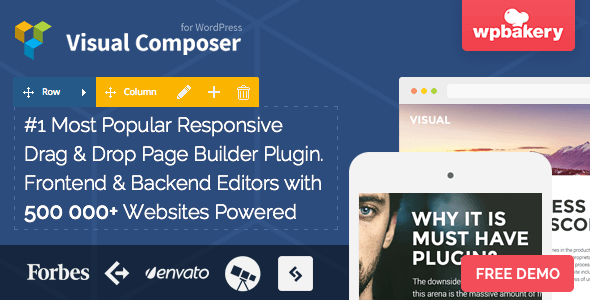 With Logos Showcase – Visual Composer Plugin for WordPress you will get what you want without any line of code. All you need to do is to generate de shortcode selecting your desired options to display, pick a favorite theme and select a CSS3 effect. Choosing the desired predefined effect for your logo group was never easier. We have built different responsive themes ready to display your logos on any resolution and device. The themes are mobile ready and can be changed very easy. We have set 25 image effects that are both edgy and appealing. Try them all. Use the one you like best and fit for your logos. Pick individual fields for each logos group. You can display and activate the Full Name, the External Link and the ToolTip Description. You can add tooltips on each logo image and including a custom content. You have 10 features to build your desired logos slider. All the options are very easy to change and user friendly. Display your logo as a carousel slider with some transition effects and nav buttons. Logo Showcase for Visual Composer plugin is the most advanced and shiny plugin developed to display your logos in so many ways. In just few minutes you will have an active and special list of logos. Logo Showcase for Visual Composer plugin is already in use on some of our regular clients websites and we know that the next think they want is to have a nice preview system for the templates. As far as we are concerned this is the next feature we want to include, if you have any suggestions please let us know. If you want to use Logos Showcase for Visual Composer plugin, all you need to do is install WordPress 3.5+, and install the Logo Showcase plugin. This entry was posted in Add-ons and tagged carousel, client, clients, filter, grid, logo showcase, logos showcase, partners, responsive, shortcode, slider, sponsors, tooltips, visual composer, worpress logos on September 18, 2015 by Vera Jaman. This plugin lets you add great looking tooltips to words or key-phrases of your choice throughout your website. Just create one tooltip and it will automatically display for the chosen word or key-phrase throughout your entire website. Choose between 30 color schemes. All based on CSS without any images. You can choose which sections of the website you want to show the tooltips as well as choose the specific templates it should show on. If there are certain tags you would like to exclude you can simply add them and the tooltip will not be rendered if the text is inside the tags you add. If you have our Pages by User Role for WordPress plugin you can also choose which user roles that will be able to see the tooltip. Let’s say you only want a certain group of people to be able to see the tooltip. Then you just set the Access Control to this user role. Choose which specific Post Types the tooltip will appear on: Posts, Pages, and any Custom Post Types. Set which Tags to skip. Example if you don’t want the tooltip to render on h1, h2, h3 etc. Set which Post and Page ID’s to skip. 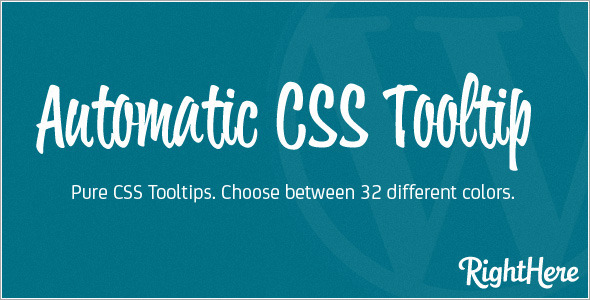 This entry was posted in Utilities and tagged automatic, automatic tooltip, css tooltips, css3, info links, tooltips, wordpress on August 10, 2015 by Vera Jaman. With this plugin you can display a set of images as a grid or in a carousel slider. Fully compatible with the brand new WordPress v4.1.1! Any other creative use you might think of! Also compatible with the brand new WordPress 3.8! Normal grid The images will have a fixed size, but they will adapt to the available space, adapting also to different screen sizes. Responsive Grid The images will be displayed in a grid with the number of columns you set and the images will resize to fit the columns. On smaller screens the grid will adapt, and the images will resize accordingly. In smaller screens if the number of columns set is to big for the size of the screen, less columns will display. Horizontal Carousel – Responsive The images will be presented in a horizontal carousel that is responsive and also works well in touch devices. In the settings of the plugin, you can set how many slides to show, the transition speed, if auto scroll is enabled, and many other settings. Grayscale Style Compatible with most browsers, you can choose to display the logos on a grayscale version and a bit of transparency, and choose if on hover the image will have the original colors or not. Box Highlight Simple style, that on hover displays a highlight of the image. Tooltips You can choose to display a tooltip or not. Future versions of the plugin will probably include more built-in styles as it is easy to add new ones. This entry was posted in Interface Elements and tagged carousel, client, clients, grid, hover effects, logos, partners, responsive, slider, sponsors, tooltips on March 31, 2015 by Vera Jaman. Serpent is a responsive social network WordPress theme build to power sites with multiple users and provide community content sharing. Serpent is a responsive theme. It uses a framework that permits the site to be accessed on all mobile devices, including iPad and Android powered tablets. Mobile-phone layout is also included. You can now view your site even on display resolutions as 320×480 wide. Enable the “Like” feature to let users easily access faved posts and raise their rating. When a certain post reaches the limit of 50 likes it will become hot. The like limit can be changed from backend while the number of likes for all posts can be randomly generated. Let your users login or register without leaving the page. The built-in eye-candy AJAX form will pop-up when trying to enter site’s prohibited areas, such as “Add a new post” or “View NSFW posts”. Users can also register/login to your site using their Facebook accounts. Use keyboard’s J, K, L, C, V and R keys for different actions on your site: scroll to next post, scroll to previous post, love a post, comment post, view post or display a random post. These keys combination are now working on post page as well. 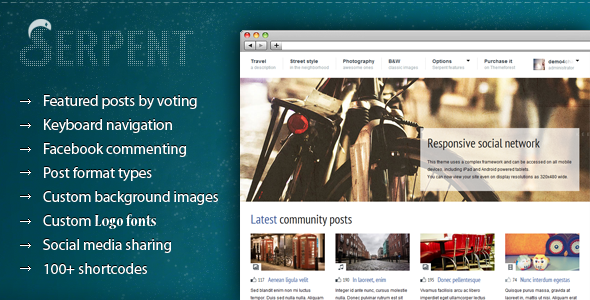 Let your registered users upload posts directly from front-end. The front-end submitting permits users to choose their post format: image, video, audio, text and attachment. Each and every single format can be enabled or disabled. Set your blog mainpage to display either Featured or Fresh posts, or both. Mainpage is also available as a static page. Ever wondered how to tell your users of a specific feature or important message on your site? You can now achieve this with theme’s built-in tooltip manager. You can use it on every single page on your site being able to add an infinite number of such hints. You can either enable the default comment system or opt for the Facebook comments. Add your Facebook application ID so you can moderate comments. You can create an unlimited number of slideshows and define different ones for desired pages or posts. The site uses unlimited sidebars for you to be able to insert as many widgets as you need to get the most of your theme: Categories with icons, Content tabber (hot posts, new, comments, tags), Flickr, Twitter, Latest posts, Social media, Top authors, Submit content. All posts have built-in social-media share buttons that users can click and promote any content of your web-site. Enable or Disable them for any particular post or page. Serpent comes with a revised powerful back-end to let you control all sites option without the need to hack or customize your own features. The theme also uses built-in breadcrumbs, dropdown menus, image resizing, 100+ shortcodes, built-in related posts and social-media sharing, and comes with an extensive documentation to help you get started. This entry was posted in Blog / Magazine and tagged connect, content sharing, elegant, format, hot-keys, ipad, keyboard, modern, tooltips, view-port on January 21, 2015 by Vera Jaman.